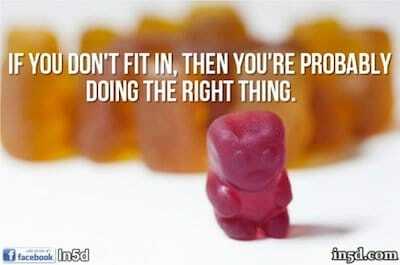 Do you feel like you sometimes don’t ‘fit in’ with society? Have you ever caught yourself looking at all of the unhealthy food in someone else’s shopping cart at the grocery store? When you see people blindly following others, does it make you feel a little uncomfortable? Are you more likely to follow your own path instead of what ‘everyone else is doing’? If you answered yes to any of these questions, then you are not alone! People who strive to fit in and conform to society are some of the most subservient and controlled people you’ll ever meet. They tend to follow the flock and are highly influenced by other people’s opinions versus formulating their own regardless of what other people think. They seem to be more concerned about what other people think about them than how they feel to themselves. For the conformists, the only critical thinking needed involves how other people may view their perceptions. We realize that most of everything we have been taught in history is either a lie or some form of propaganda. Much of our true history and origins have been hidden from us, despite concrete evidence showing that mankind has been on earth for hundreds of thousands of years. This is part of the brainwashing we receive through the indoctrination system commonly referred to as public education. If you question any official “story” taught to you in school, then you’re looked down upon because you are not conforming to governmental learning expectations through state sponsored propaganda. As students, we tend not to question authority and willingly accept our teacher’s lessons as the truth. Our minds become conditioned to regurgitate these lessons in order to graduate each year. When we attend school, not only are the students conforming to the teachers expectations, the teachers are conforming to the teaching of propaganda and agendas with little liberty to stray from the state sponsored textbooks. The medical industry is no different. For example, according to Dr. Leonard Caldwell, there are over 300 cures for cancer but most doctors are required by law to use surgery, radiation or chemotherapy before any holistic measures such as the Rife Machine, THC Oil, etc..bBecause the physicians are not learning holistic medicine in college, they are trained to use archaic methods in conjunction with Big Pharma, which has not cured anything since polio. If you trace who originally funded the medical universities in conjunction to Big Pharma, you will find one name: Rockefeller. Most physicians do not know the history behind the universities they attend, who is really behind Big Pharma and how the major players are hiding under the guise of philanthropy in order to receive tax breaks while protecting their family fortunes. Unless you’re a holistic physician or offer non-invasive options, then the majority of medical practitioners are also blindly conforming to societal expectations. Our media boils down to talking heads reading propaganda scripts with relatively no positive news items, yet those who “fit in” will watch the nightly news on a daily basis, followed by their favorite TV “programming” which takes them even further away from finding themselves. Through reality TV shows and commercials, people are being told what to think, how to act, what to eat, drink, listen to and buy. Television is responsible for conditioning the mind to think in ways that are not obvious as well. For example, a typical commercial will not only try to sell you a product, but an image and a societal expectation as well. The same commercial is not going to tell you about the aluminum toxicity of the can or the genetically modified hops and barley that you’re consuming, along with the long term effects of the consumption of this product. They’re not going to show people who are not within their target audience and virtually everyone is always happy and smiling when they’re trying to sell you this product. These actors are usually participating in some sort of extroverted group activity, which subconsciously tells you that if you’re not a social extrovert, then you don’t fit in. In psychology, people often mirror that which they fear within themselves. For example, if someone says they “hate” another person, then it usually means that there’s something within that the name caller hates within his or herself. I posted the above picture on the In5D Facebook page and a woman commented one word: “stupid”. When I looked at her personal Facebook page, virtually all of her “Likes” were celebrities and movie stars, which is basically the idolization of others and reflects the amount of time she spends watching TV. She also “Likes” expensive jewelry and high fashion, which relates to her materialistic tendencies. Both of the people she was “Following” are in politics. Who she pretends to be in front of others seems to be more important to her than finding out who she REALLY is, which is a spiritual being having a human experience. When the dollar inevitably crashes, it’ll hit people like her a lot harder than those of us who “don’t fit in”. Her ego, vanity, ignorance and failure to be open minded is a reflection of what she fears within herself. In other words, it’s easier for her to call other people stupid than to look in the mirror and see her own reflection. Dr. Spock once said something along the lines of, “In an insane society, the insane appear to be sane.” To those who are awakened, does that statement sound like the truth to you? Non-conformists are more likely to use critical thinking and will research topics to find a suitable answer versus assuming that our governmental agencies will always look after us and would never allow us to ingest harmful ingredients, such as aspartame and fluoride. Those who don’t conform are also more likely to look within for answers because the external answers are fabrications, lies or are unacceptable. If you feel like you don’t ‘fit in’ with most of society and your actions are respectful, responsible and love-based, then chances are, you’re on the right path! Copyright Information: Copyright in5d and Gregg Prescott, M.S.. This content may be freely reproduced in full or in part in any form. This entry was posted in Uncategorized and tagged aluminum toxicity, Asch Conformity Experiment, Asch Conformity Experiments, aspartame, Big Pharma, Bud Light Lime, conform, dollar, ego, flock, fluoride, history is a lie, holistic, Leonard Caldwell, lies, materialistic, Media, propaganda, Rockefeller, THC, You. Bookmark the permalink. Reblogged this on Flying Tiger Comics.